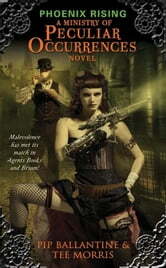 Co-authors Pip Ballantine and Tee Morris ingeniously reimagine England’s Edwardian Era in Phoenix Rising—a hilarious, rip-roaring steampunk fantasy romp that the voracious fans of New York Times bestseller Gail Carriger will eagerly devour with great relish. In this outrageous, non-stop adventure, Ballantine and Morris introduce us to Agents Books and Braun of the ultra-secret Ministry of Peculiar Occurrences—the most delightful duo of very British evil-bashers since The Avengers, Emma Peel and John Steed. With its malevolent secret societies, earth-shattering conspiracies, breathtaking derring-do, and absolutely wondrous weapons, Phoenix Rising out-Sherlocks Robert Downey, Jr.’s Sherlock Holmes.